The giraffes (Giraffa camelopardalis) look like no other creature on earth. 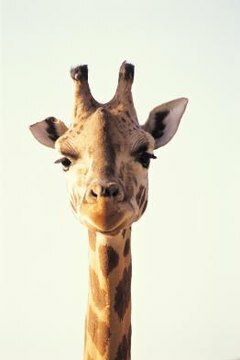 Their funny, hornlike ossicones, orange-and-brown spots and iconic long necks beg an explanation. As such, the giraffe often comes up in discussions about evolution. A tour through their relatives, living and extinct, reveals much about them. Before delving into the past, a brief detour to the giraffe's closet living relative can shed some light on those ancestors. The okapi is the only other member of the giraffe family, Giraffidae. The okapi grows much smaller than the giraffe, and has a shorter neck. Only the males have ossicones, which grow smaller than a giraffe's. Eumeryx—or a close cousin of Eumeryx—was probably the ancestor of the even-toed ungulates (a group of hoofed animals) including the giraffe family. Eumeryx resembled a small modern deer. Neither the males nor the females had any kind of horns, antlers or ossicones. It lived about 30 million years ago during a time period called the Oligocene. Climacoceras was the earliest undisputed member of Giraffidae. It lived in modern-day Kenya. Climacoceras resembled the modern okapi. They did have antler-like ossicones, a defining feature of the giraffe family. As adults, Climacoceras grew to a height of 1.5 meters. This species lived during the Miocene epoch, 15 million years ago. Giraffa jumae was most likely the direct ancestor of the modern giraffe. G. jumae had a wider range than modern giraffes, extending from the modern giraffe's homeland in sub-Saharan Africa through the modern Middle East as far as Asia Minor. They closely resembled modern giraffes, but grew about 1 meter taller. G. jumae lived from 13 million years ago, during the Miocene, until about one million years ago, during the Cenozoic.